This package includes FlipIt and Loose-Leaf. This package includes FlipIt and LaunchPad and Loose-Leaf. Helping you apply an economic way of thinking. 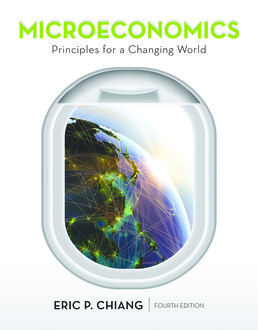 Formerly CoreEconomics and now titled Microeconomics: Principles for a Changing World, the new edition is thoroughly contemporary, fully integrated print/technology resource that adapts to the way you want to learn. This concise book focuses on the topics most often covered in the principles course, but with this edition, it offers a stronger emphasis than ever on helping you apply an economic way of thinking to the overwhelming flow of data we face every day. The author fuses the text and online course space into a cohesive approach that embodies the book’s founding principles: using technology as a tool for learning, helping you master the data literacy you’ll need, and providing a truly global perspective.